The crossbow was an important weapon for medieval European warfare. Crossbows were already used among the Greeks and the Romans. A Latin text, De Re Militari, by military historian Vegetius, mentions crossbows. From Roman Gaul the only images of crossbows from Roman times have been preserved, these are images of hunters. In medieval Europe, crossbows were used in the war, especially from the twelfth century. The longbow was easier to work with, as the crossbow took a long time to reload because of the crannequin that reloaded heavy crossbows. The crossbow was seen as an evil weapon, and there was a time when Christians were not allowed to kill other Christians with a crossbow. After the Middle Ages, the crossbow was replaced by firearms. This crossbow is intended for decorative use. It has beautiful wood carving decorations. 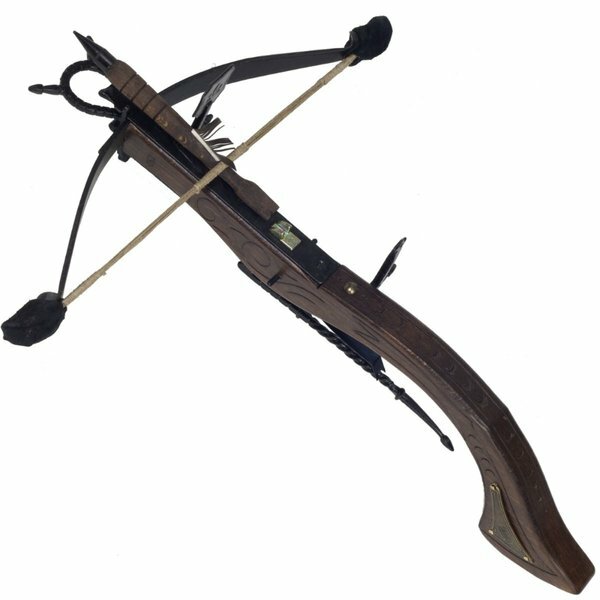 The crossbow is delivered including a crossbow arrow.